Stylish pet furniture for the pets you love by people that love pets. 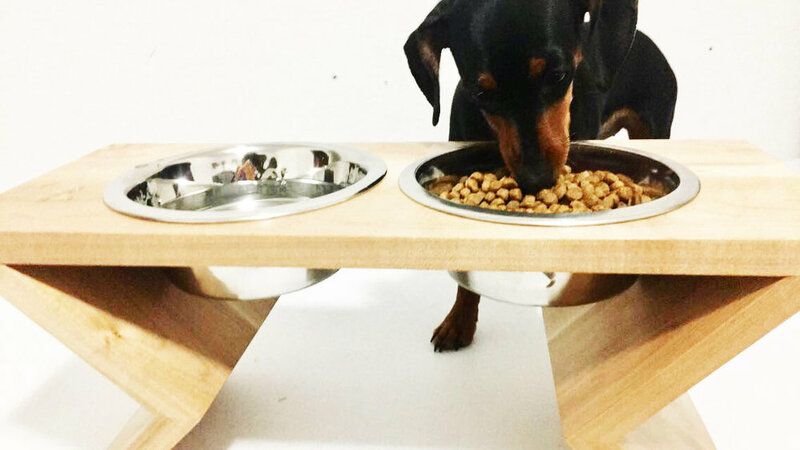 At Modern Paw Furniture we create handcrafted, solid wood, mid-century modern pet furniture for your fur baby! Our designs are as unique as they are well made. Each piece is put together utilizing traditional wood working methods. You will never find a screw or a bolt in our products. By utilizing joinery, we are able to create much stronger heirloom quality for you and your best friend. Walt, the Mastiff king enjoying his new XXL Cooling gel memory foam pet mattress! 40" W x 55" L x 6" Extra thick! Happy doggie!! Another happy fur baby enjoying his large IRISA elevated pet feeder featured in Walnut. Max, the Corgi mix enjoying his new 100% cooling gel memory foam pet mattress. Wookie, the Labradoodle loving her new 100% cooling gel memory foam mattress! Look at that fur baby enjoying her new platform bed, pink mattress, and elevated pet feeder by Modern Paw Furniture!! Join Us In Supporting Our Cause! Modern Paw Furniture recently donated one of our beds to their silent auction and will continuously donate to their organization however we can. DFW Rescue Me depends on generous donations from individuals, corporations and foundations to fund our medical care, supplies and operational expenses. Dogs in their program are provided with food, shelter, veterinary care and adoption events, where they can find their forever homes. We need your help!